Unravel Two is the sequel to ColdWood Interactive’s 2016 console and PC game featuring the titular Yarny, Unravel, in its debut side-scrolling adventure, platforming game. Two years later ColdWood Interactive and EA released the sequel Unravel Two which has now found a home on the Nintendo Switch. The second game is a two-player cooperative game, though you can play alone if you choose. The story of Unravel Two unfolds level by level through a series of cut-scenes and by in-level ghost-like flashes of two children trying to escape, a terrible situation. That situation unravels, pun intended, as the two Yarnies make their way through the woods, streets, river, forest, and more. The scenes glowing, foreboding haze leaves you with a heartfelt despair as you see the scenes happening in the various locations. Some settings also have you being chased by a dark shadow monster, similar to that from the TV series LOST. While most of the story is told through these past ‘glowing hazes’ there is still an odd connection you as the gamer seem to have. More importantly though, is the way the yarn characters seems affected by what they are seeing and how they are emotionally pulled into the story. Unravel Two controls are simple. You navigate left and right through the world by moving the left joystick. There are simple emotions your Yarny can express through the D-Pad. These can be helpful when working with your partner to signal attention, especially if communication isn’t your strongest attribute. The ZL button is your grab connecting which can be used to hoist your character upward towards your partner, which looks similar to scaling a mountainside. ZR is your Lasso which you will use a lot to interact with colored hooks in the game which allow you to swing like a pendulum. You can also use the lasso to tie a knot and pull levers, boxes, and other pieces of the environment towards your yarny. A/right button is your untie button which releases your knots and B/down button is your jump. Since Unravel Two is a puzzle game you also have the option to press in the left control stick to gain access to the in-game hints if you get stuck. Each level in Unravel Two will take you 20-40 minutes to complete on average. The main goal is to reach the end of the level and in doing so in a shorter time frame you will be awarded either a Gold, Silver, or Bronze ranking. After each completed level you are graded on whether or not you found all the collectibles (small glowing orbs), if you completed it without dying (something my daughter and I struggled with) and your time to complete. Finishing a level also opened up challenge areas which are more or less a course in which you need to avoid the black smoke monster and get to the end of the stage. After completing Unravel Two’s main campaign the challenge levels and time challenges may keep you coming back for more, though the reward for completing them isn’t as fulfilling to me as experiencing the story of the Yarny’s and the children seen in the flashback. Unravel Two has the same art style as the first game and looks utterly gorgeous on the Switch in docked mode. The visual fidelity of the landscapes, building exteriors and interiors, the water, and the forest fire all look incredible. The scale of the world against your smaller yarn protagonist is quite the sight as the world around you towers over you. Each level has a unique mood that it sets, as the game starts off ominous but then quickly moves to melancholy and downright dreadful. There are moments within the levels that will get your heart racing through to the end with your little yarn friends, as well as times that allow you to take pause and take in the scenery. As a character made of yarn though you are subject to a wild turkey, hungry fish, burning forest, and mechanical packaging plant. The way the game turns the world into the enemy you’re running from is very poignant and alludes a bit to the story of the children and how their environment was the torture they were running from. For the most part, Unravel Two’s soundtrack is mostly background music that subtly subverts your mind into wandering about the peaceful journey and stressing out during the more upbeat tunes that play while you’re being chased. Just like the world in the game and the artistic realism of the backgrounds and items you’ll come in contact with, Unravel Two’s music feels natural and soothing while also being used to invoke emotion. If there is one complaint I have with Unravel Two is that this game really plays differently as a single-player game. Having to go through the puzzles by yourself is more of a chore than if you and a partner were to sit down and play through the game together. Many of the puzzles require you to work in tandem to solve them. If you are aiming for a decent time to completion having another human to play with will surely boost your time. Unravel Two is an awesome game on the Switch. It has a beautiful story to tell and is a great two-player cooperative game. 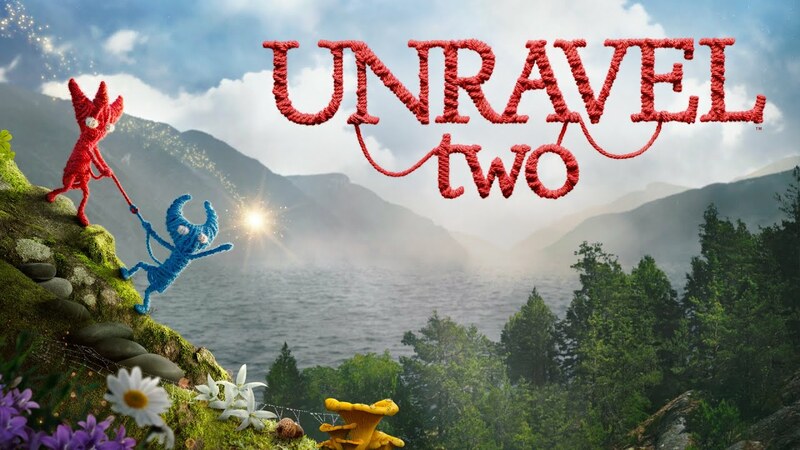 If you have played games like Pode or Degrees of Separation, and enjoyed them, Unravel Two will be another one you will want to pick up and play. Personally, I played the game with my nine-year-old daughter and really enjoyed our time together as we solved puzzles and work alongside each other to complete Yarny’s adventure.